It's Christmas Eve and Ricky warns his young son: "Santa won't bring the tree and the presents until you go to sleep." It takes some effort to cajole the boy, but after Lucy convinces him that Santa will have no trouble coming down the chimney ("he brings the North Pole with him and slides down it like a fireman. "), he's off to bed. The coast clear, Fred and Ethel arrive with a Christmas tree. "It's a gift from me and Ebenezer," Ethel reveals about the five-dollar fir tree. The four friends begin to trim the tree until Lucy discovers "a branch on the right side that spoils the shape." Fred solves the symmetry problem with a pocket saw as Ricky says to Lucy, "Our lives have sure been different ever since you told me you were going to have a baby." 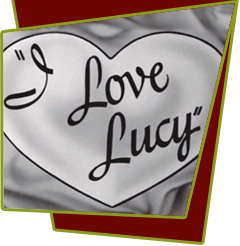 We flash back to the sentimental moment at the Tropicana in 1952 when Lucy breaks the baby news to Ricky (from "Lucy is Enceinte"). This reminiscence over, we discover that Fred got carried away with his saw while listening to the baby tale, the tree is now a spindly stripling. While Fred goes off in search of a replacement, Ethel and Ricky start singing "Jingle Bells," but when Lucy joins in with her off-key rendition, they recall, once again in a flashback sequence, the barbershop quartet harmonizing of "Sweet Adeline" (from "Lucy's Show Biz Swan Song"). With the last note sung, we return to the Ricardo apartment just as Fred enters with a new tree, he got this "last minute" one for only fifty cents. The foursome starts decorating the tree and discussing Little Ricky's Christmas gifts, as Ethel realizes: "It seems like only yesterday he was born." This is the perfect lead-in to a flashback of Ricky, Fred, and Ethel rehearsing Lucy's trip to the hospital (from "Lucy Goes to the Hospital"). Finally, it's Christmas morning. The four principals are up early and wearing Santa outfits. When they hear Little Ricky approaching the living room, they hasten to the kitchen so the boy won't be disillusioned by seeing four Santas. Suddenly, however, there are five St. Nicks crowding the kitchen - who's the real one? The "real" one disappears optically as the Ricardos and Mertzes stare into the camera and say, hesitantly, "Merry Christmas, everybody." Special Notes: Also known as 'The Lost Episode' or 'Jingle Bells'. Because this was a "special" and employed so many long flashback sequences. This episode was not sold into syndication with the rest of the series because CBS didn't think that the viewing audience would want to watch a holiday episode at other times of the year. Only a portion of this episode was telecast in December 1981 on Rona Barrett's short-lived NBC series, "Television: Inside and Out." It remained unseen until the year Lucille Ball passed away and was aired by CBS on December 18, 1989. In December 1990 CBS aired a colorized version of the episode. Desuli featured a special Christmas tag to "Drafted." It featured the Ricardos and Mertzes around a Christmas tree and five Santas.